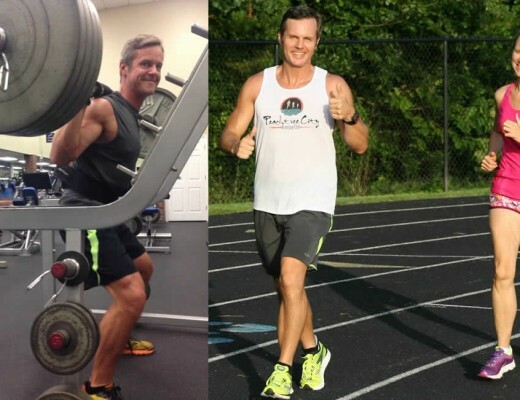 What makes this Married Runners blog unique? The Chattahoochee river starts as a spring on the Appalachian Trail, just below Georgia’s tallest mountain – Brasstown Bald. It flows in a generally south/southwesterly direction through the northwest corner of Atlanta as it works it’s way to the Gulf of Mexico. 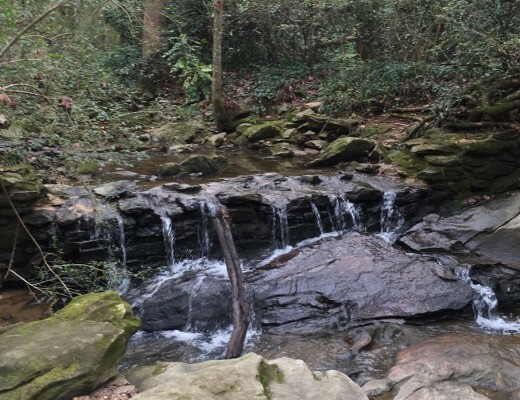 The north side of Atlanta has long featured an excellent set of parks and trails along the Chattahoochee River known as the Chattahoochee River National Recreation Area. 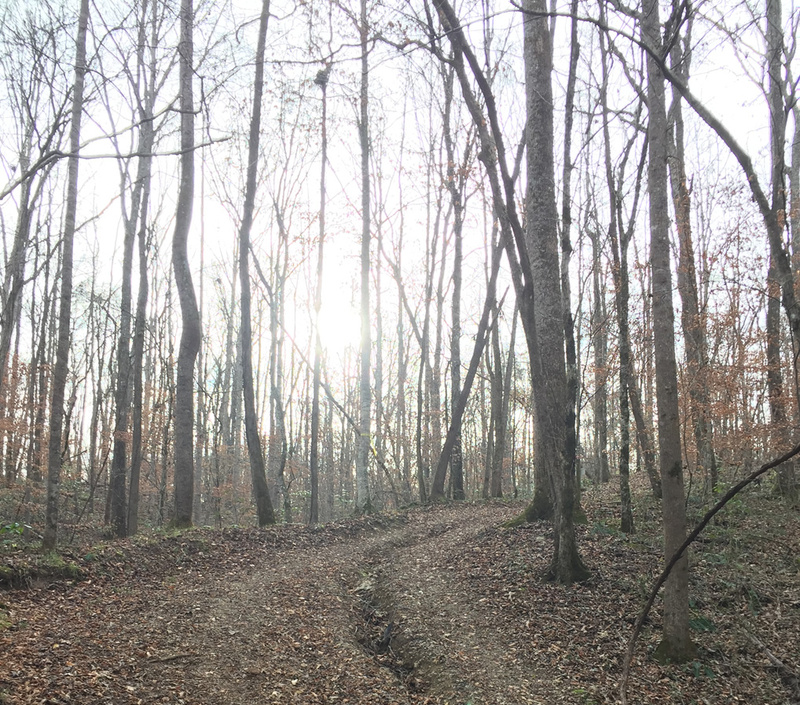 The south side of Atlanta is starting to see the development of Chattahoochee-based parks, paths, and trails. We recently “discovered” the Boundary Waters Park and feel it’s a great start of more to come for those of us in the south metro area. 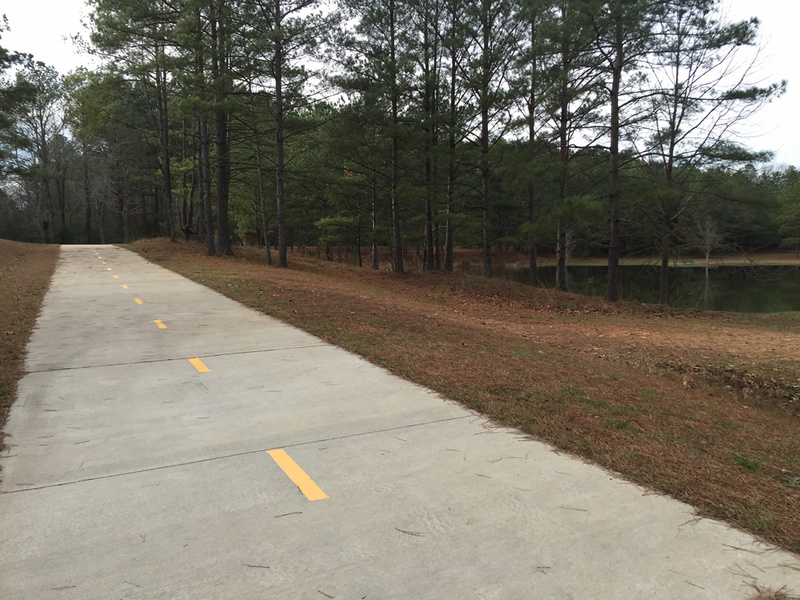 The park also features one of the many trail links to the planned 98-mile Chattahoochee Hill Country (CHC) Regional Greenway Trail. 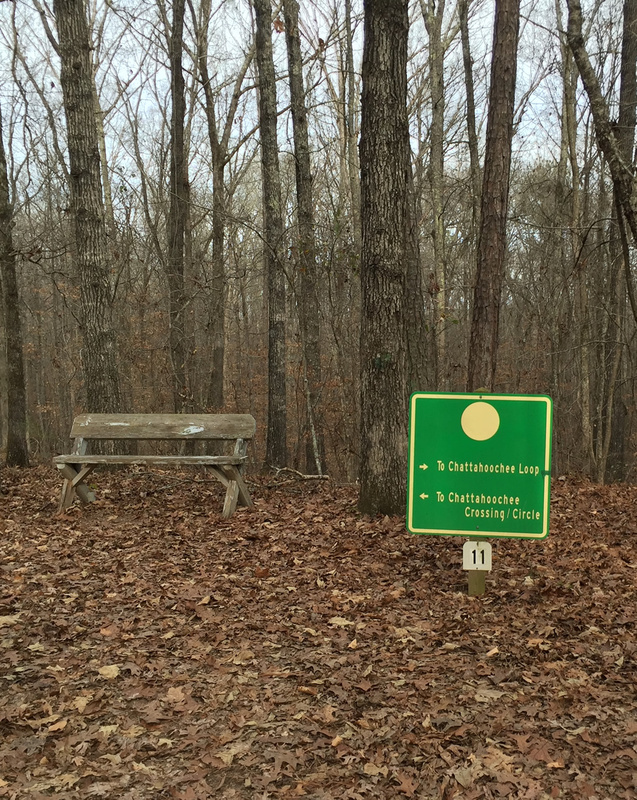 Boundary Waters Park is managed by Douglas County Parks & Recreation and is located along the Chattahoochee River on Ga. Hwy 92, halfway between Douglasville and Fairburn, GA – very near the newly incorporated city of Chattahoochee Hills. According to the official website, Boundary Waters “…is a beautiful 500-acre recreation complex located along the Chattahoochee River in Douglas County, Georgia. 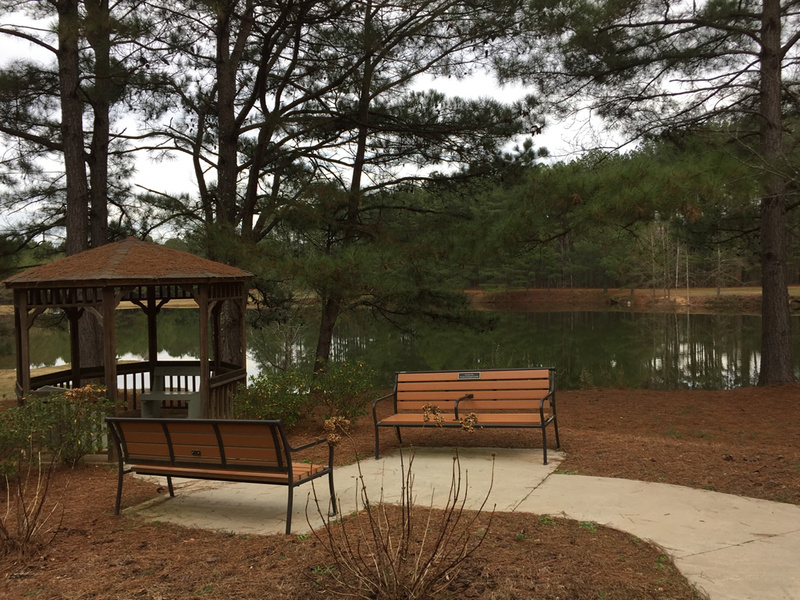 Much of the park is dedicated to active recreation.” It features an aquatic center, fishing ponds, athletic fields, and 12+ miles of trails for hiking, biking, and equestrian use. Official map (courtesy of Douglas County Parks & Recreation): Boundary_Waters_Trail_Map_Includes_Greenway_1-8-15. The green, yellow, and blue trails are all flat and relatively easy. The red trail has some flat sections, but also features lots of hills and is, I think, the most scenic of the trails. 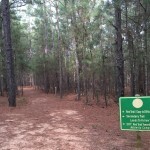 During my visit to the park, I ran the green trail, part of the yellow trail, and all of the red trail. The trails are all very well marked with signs at major intersections and blazes all along the way. I’ll describe the trails as I ran them in more detail below. I parked my car in the large parking lot behind the Aquatic Center and near the trail head of the Chattahoochee Hills Country Regional Greenway Trail. The trail head is well marked and seemed to be a good place to start exploring. 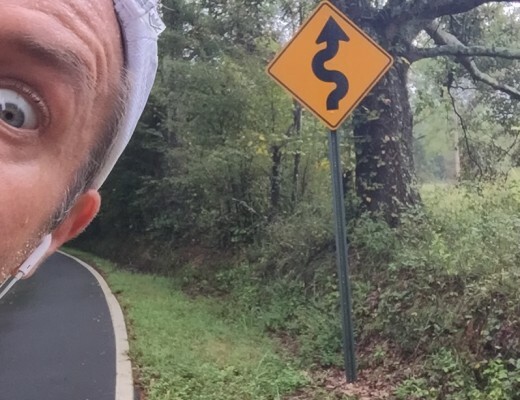 Here’s what the trail head (and my head) looks like. 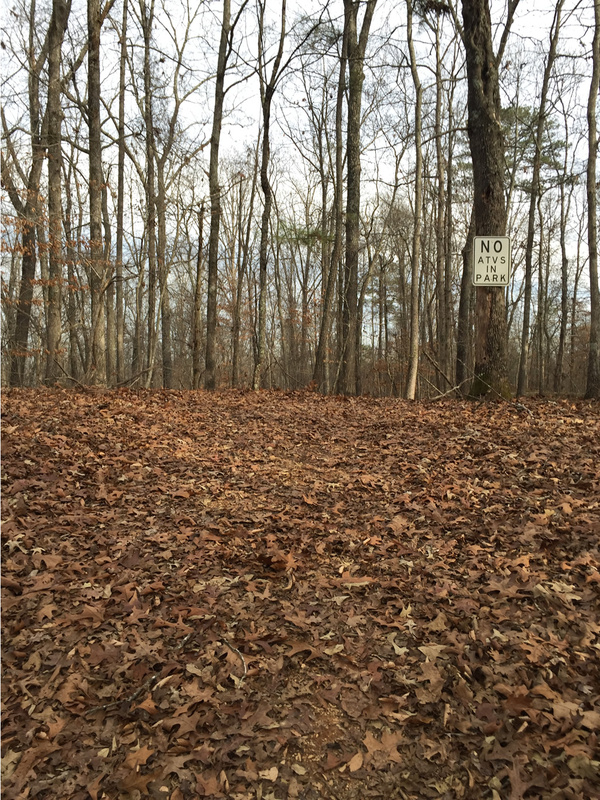 I was running on an unusually warm Sunday afternoon in December and the trail was not crowded at all – there may have been about four cars in the parking lot. As you might expect, the greenway trail was pancake flat. It begins in a southwesterly direction towards the first intersection at the blue trail (Red Hawk loop). I opted not to do that short segment, so I continued my journey around the bend in the trail heading in an easterly direction near the pond. The pond is about a 1/2 mile from the parking lot, my start point. Near the pond, the blue trail intersects the greenway again and passes adjacent to the pond and parallel to the greenway. I stayed on the greenway, proceeding in an generally northeasterly direction towards another main intersection with the blue trail. The map shows the start of the red trail near this intersection, but I couldn’t find it and continued my journey on the greenway towards the sports fields. As I got close to the sports fields, I spotted the red trail and resumed my journey on that. Ah, natural trails at last! The red trail starts out (and in many places) appears to be an old road bed – wide and easy to run. Trail runners and mountain bikers usually refer to that as “double-track”. I noticed some cross-country course markings, so apparently they run races out here, too. 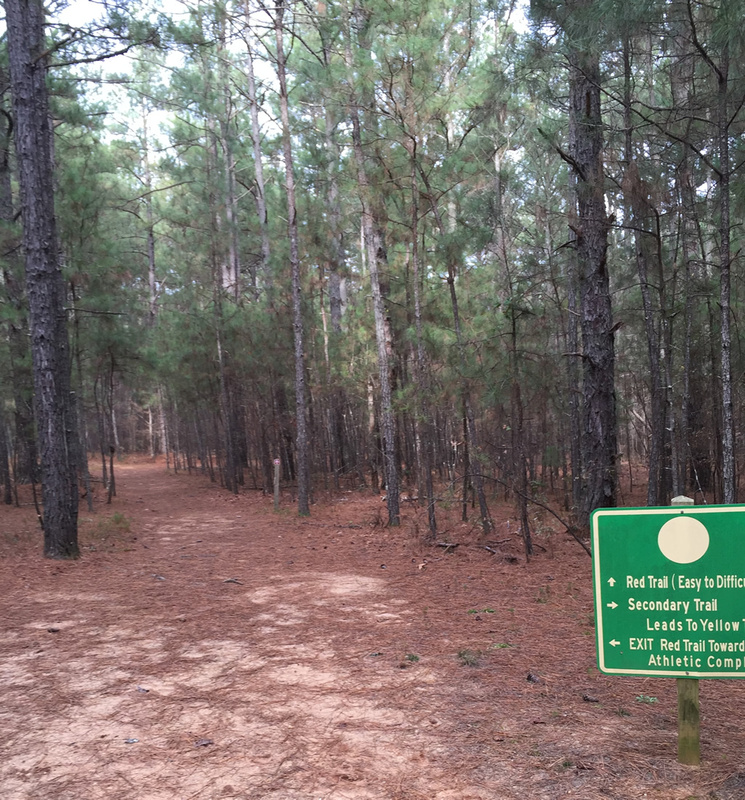 As the trail headed in a southeasterly direction, I came to a trail junction and decided to cut over to the yellow trail to explore some of that. At the end of the short connector trail, I headed left (northeast) and then right (east) onto another connector towards the river. Following the river, I came to the spot on the map marked “Southern Red Oak”, which featured a horse hitching post and the tree, which was looking rather sad that day. I didn’t linger and so the journey continued back towards the red trail. There are several connector trails that aren’t well marked and I ended up taking one (or two) of them over to the red trail from the northern tip of the yellow trail. A few muddy patches in this area, but very usable. At this point of my journey, I was near mile 2 on the eastern side of the baseball fields. The red trail continues north following the river, but not right next to it. Very flat and easy running along this stretch heading north along a ridge line. 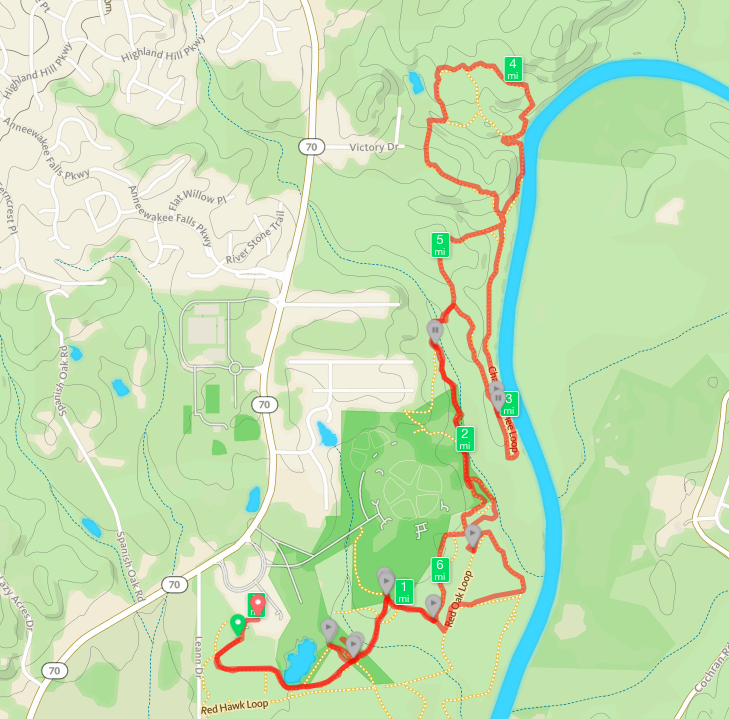 About a half mile later, the red trail veers right (east) down and across a small creek (Gilbert Branch) and up a small hill on a beautiful ridge overlooking the Chattahoochee River. The ridge is framed by the Gilbert Branch (creek) to the west and south. 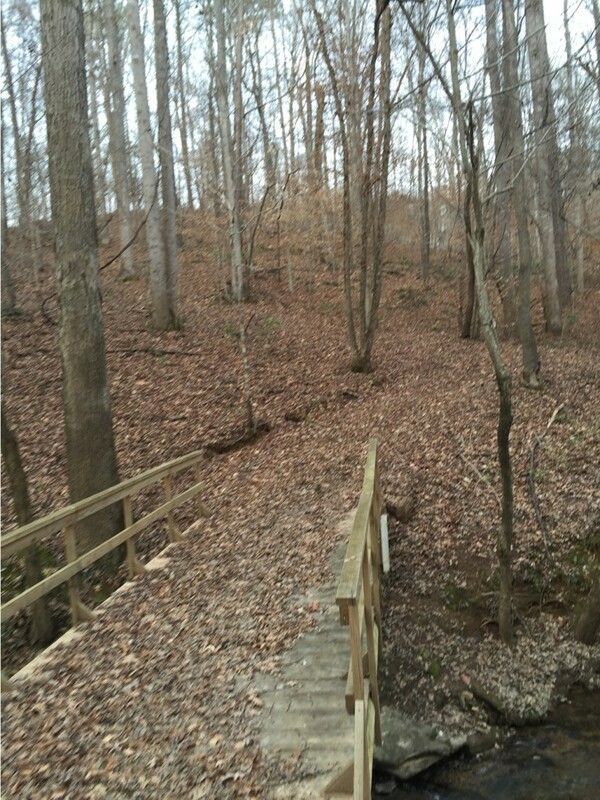 This was the Chattahoochee Loop (picture to the right). To me, this was the most scenic part of the trail. It’s a loop, so it matters not whether you go left (north) or right (south). I went right so I didn’t have to double-back. 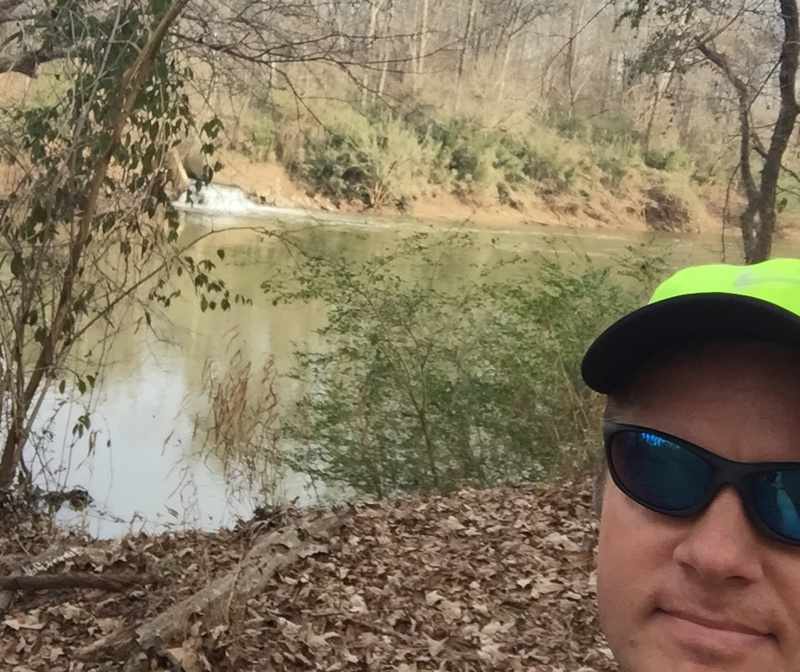 Running south, I found myself on a ridge overlooking the Chattahoochee to my left and down about 30-40 feet. It’s a great vantage point. The best was yet to come. Not quite a half mile later, the trail veers sharply to the left (east) down off the ridge and around so that you’re running north right along side the river. 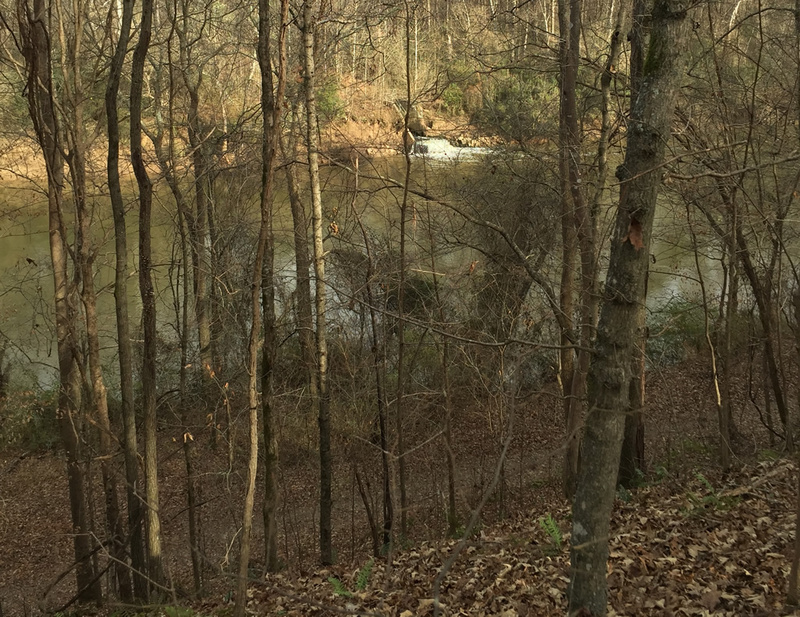 The next picture shows a view of the river from atop the Chattahoochee Loop ridge (you can see the trail below and next to the river). This was my favorite part of the trail. The picture below was near the three mile mark of my journey and is the same view as the previous picture, but this one was taken on the lower trail loop segment next to the river. 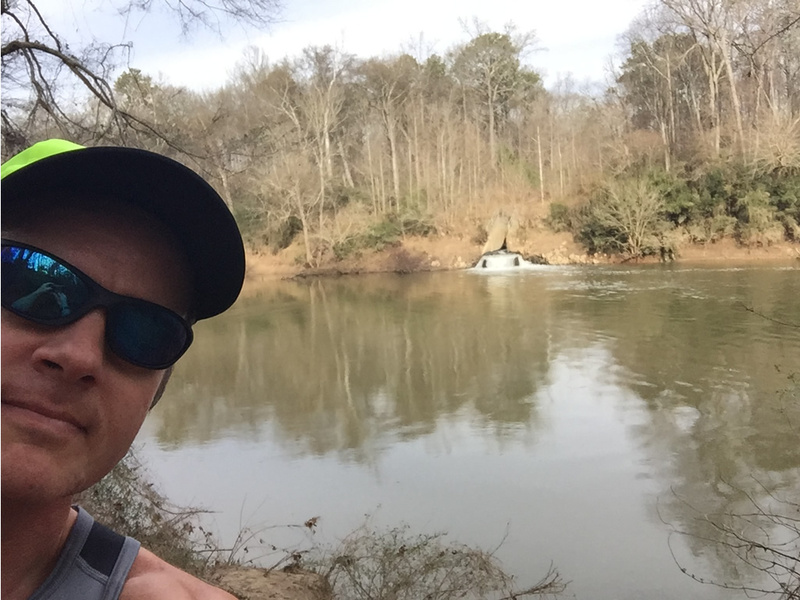 I continued north along the banks of the Chattahoochee, a scene very similar to some of the trails I’ve run along the river in the northwest part of Atlanta. About a half-mile further and there’s another small bridge and intersection with another loop in the red trail. If you look at the trail map, the top end of the red trail is really a figure-eight pattern. After crossing a small bridge, I stayed to the right (east) and continuing a little further along the river until the bend. The picture above shows you what a great trail this is – scenic and flat. It was taken just before the bend in the river. Just before the 4 mile mark of my journey, the trail heads west and across another small creek (with bridge – see picture below). The picture above is right at the beginning of mile 4 – the first of several big climbs. These are the biggest climbs on the trail and there are three of them. As the above picture shows, my journey to this point was relatively flat, except for the Chattahoochee Loop between miles 2-3. The climbs aren’t technical, they’re just steep and seem even more so because everything else is so flat. All three climbs are within a single mile, so if you run this trail, be prepared for a bumpy ride! You can avoid two of the three hills by simply omitting the top of the red trail figure-eight loop (which also shaves a mile off the route). The park boundary is framed by houses to the north and west and you’ll be able to see them through the trees. As per my GPS, the first hill is the steepest and the second hill is the tallest. I think the third hill is there just to make sure you get your fill. In between each climb is a major descent and creek crossing (as is typical in hilly areas). The official park map denotes the highest point in the park (the second climb) at 842 feet elevation. I was kind of hoping for something impressive at the top, but instead there’s simply a warning sign about “No ATV’s” (see picture to the right). Maybe some trail group will put something more impressive there and give this unnamed peak a cool name. After descending the second climb (and tallest point), you’ll come back to the intersection that forms the top of the figure-eight of the red trail. After crossing the bridge, I headed right (west) and began the final climb. Here’s the view as I was literally running to the sun. 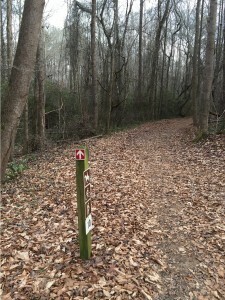 After cresting the hill, there’s a sharp descent as the red trail then levels off and in about a 1/3 mile rejoins the intersection that forms the Chattahoochee Loop described above. Since I was on my way back, I turned right (west / south) and headed back the way I came. 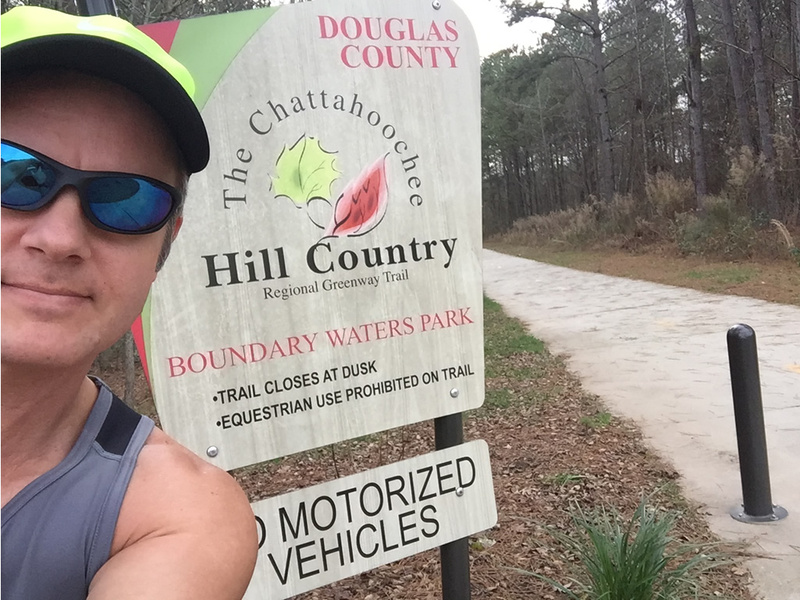 If you wanted more mileage, you could simply stay straight and do the Chattahoochee Loop and the northern (hilly) loop again and end up back here. There’s a short descent off the Chattahoochee Loop ridge and back across Gilbert Branch (creek). The trail is flat as it heads south, just to the east of the Sports Complex and fields. There are several connector trails (noted on the official park map) that don’t seem to go anywhere but simply offer additional connection points and short loops. Most of those are not that well maintained, so be prepared. 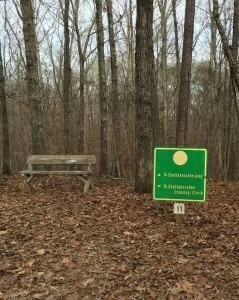 The main trails are well marked (as shown in the picture to the right). I noticed many of the trail markers were numbered, but I was unable to find a map there or online that provided a key to what those numbers mean – perhaps landmarks of some type. Hopefully, someone will be able to clue me in and I’ll update this blog post with that information. 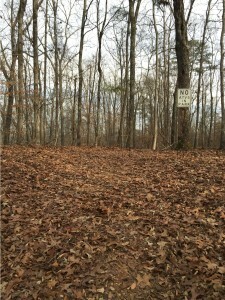 The six mile mark of my journey was near the intersection with the yellow trail connector (pictured above at the top of the blog post). The red trail heads directly west towards the sports fields. Near the sports fields, I reached the trail terminus and headed back on the paved CHC Regional Greenway Trail for my final mile back to the parking area. 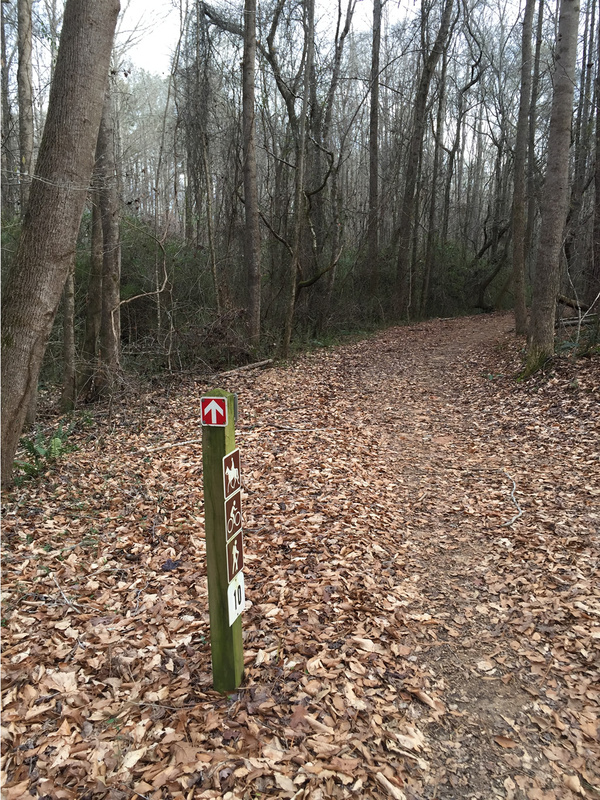 Boundary Waters Park is an excellent park for walkers, hikers, runners, equestrians, mountain bikers and more. The area is scenic, well-maintained, and offers a variety of terrain choices for casual walking or serious training. The fact that the trails are double-track and non-technical makes this an excellent area for the new trail runner (like me). 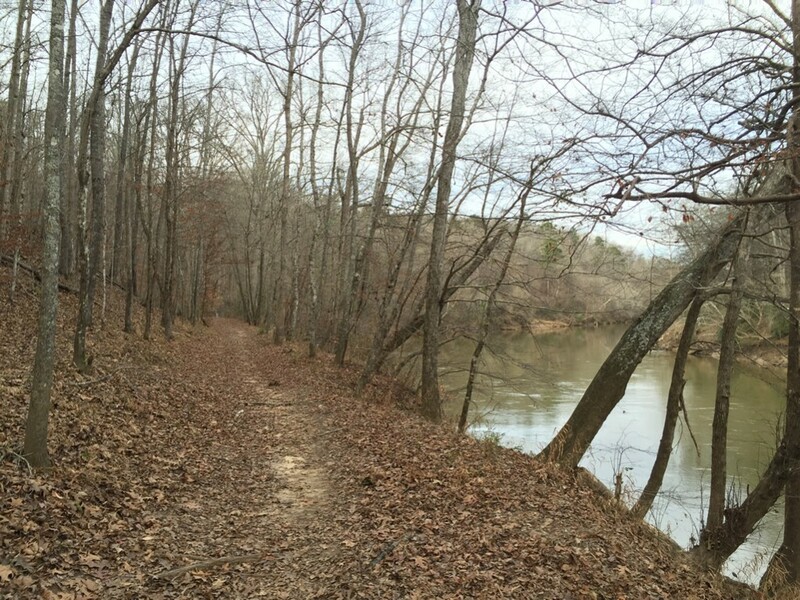 For many years I’ve driven across Atlanta to run and enjoy the Chattahoochee River National Recreation Area parks – they’re worth the drive. Now, we have a promising new start on a park and trail system in the south metro Atlanta area. Pay the park a visit and let your elected officials know you want to see more parks and trails like Boundary Waters. Joe and Mary Catherine Domaleski are happily married and live in Fayetteville, GA. 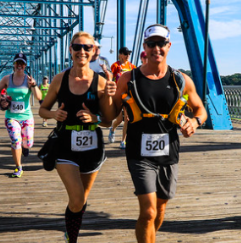 They started Married Runners to share their love for all things running and family. Thanks for stopping by! © 2015 MarriedRunners.Com - All Rights Reserved.